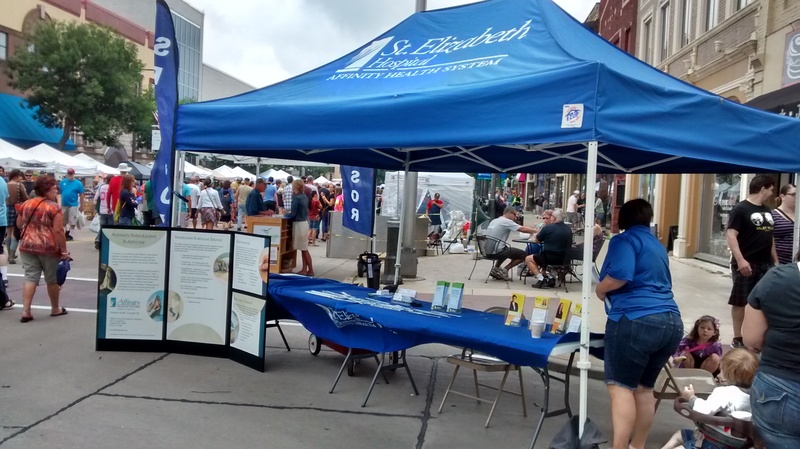 St. Elizabeth Hospital and the Affinity Health System has been a proud sponsor of the Downtown Appleton Farm Market since 2010. We recently asked them a few questions about their sponsorship. 1. Why are you sponsoring Farm Market? The Appleton Farm Market provides a terrific opportunity for our staff to answer questions, connect with people about public health issues, and provide information on services at St. Elizabeth Hospital. For example, St. Elizabeth offers a wide range of top-tier healthcare services, including a 24-hour Emergency Department, oncology, cardiology, neurology, orthopedics, OB/GYN and pediatrics. The hospital also has a neonatal Intensive Care Unit and a state-of-the-art BirthPlace Center, known for the high level of medical care and amenities it offers new mothers, infants and families. 2. What are your favorite parts about Farm Market? The Farm Market provides a convenient way to get fresh produce from local farmers, which is great for the health of our community. 3. What is one thing most people don't know about your organization? Affinity Health System now offers HealtheVisits, which provides online care for 17 common health conditions, like sinus infections, UTIs and pink eye. You can go online and submit a medical request, and within an hour an Affinity Medical Group clinician will diagnose and prescribe a treatment plan, with prescriptions as needed. HealtheVisits is convenient and has a low price of $35 per visit. People can learn more at www.affinityhealth.org/HealtheVisits. It’s available from 7am- 10pm, every day of the week. 4. Anything else you would like to share? Earlier this year, St. Elizabeth Hospital opened a new 5-story building with 90 patient rooms and a new restaurant-style cafeteria. The new patient rooms with private bathrooms are designed to be peaceful places in which to receive care. The building has many sustainable features, including “living roofs,” efficient mechanical systems and passive solar energy. The new cafeteria, the Marketplace, offers healthy fresh food options and is open to the community.